During my walk around Thomondgate in Limerick earlier this week, I visited Saint Munchin’s Church on the corner of Clancy Strand, High Road and Thomondgate. This church faces the Treaty Stone, looks over the River Shannon, across to King John’s Castle and Saint Mary’s Cathedral, and serves a Roman Catholic parish that is located between the River Shannon and the southern edges of Limerick’s border with Co Clare. Saint Munchin’s Church was built in 1922, but replaced older churches that had stood on the same site since the Penal Laws began to be eased in the mid-18th century. Saint Munchin is the patron saint of Limerick. But the saint’s original name has been lost in the passing of time, and the name simply means ‘little monk.’ According to local lore, his church, built in 561 AD, was the first cathedral in Limerick, and stood on the site of the later Church of Ireland parish church of Saint Munchin, beside Villiers Almshouse. 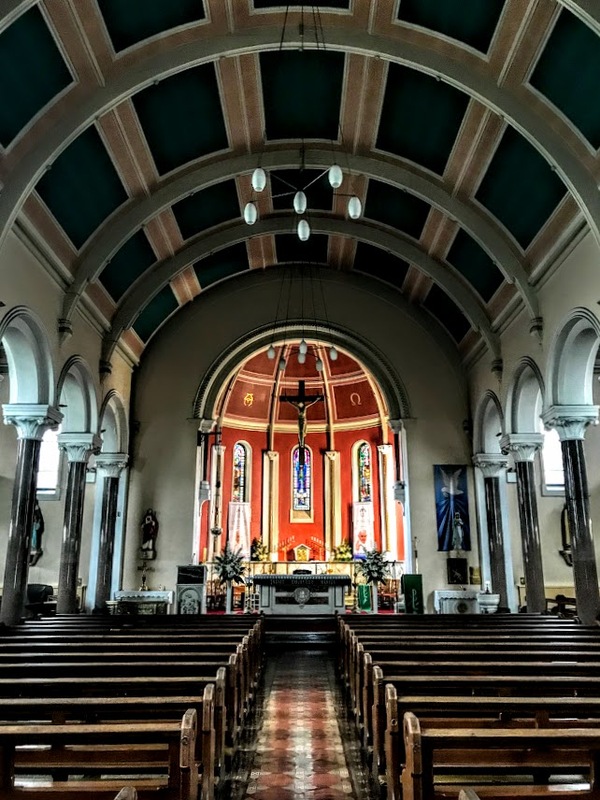 Saint Munchin’s parish was one of the five original parishes in the mediaeval city Limerick, along with Saint John’s, Saint Michael’s, Saint Mary’s and Saint Patrick’s. The Civil Parish of Saint Munchin’s lies partly in Co Clare and partly in Co Limerick, including part of the city centre. The Co Limerick part of the parish is in the borough of Limerick and part in the barony of Pobblebrien. The part in Co Clare is in the Barony of Bunratty Lower. 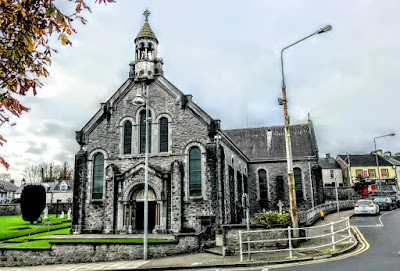 The origins of Saint Munchin’s Roman Catholic parish can be traced back to the Treaty of Limerick in 1691. An early chapel called Saint Lelia’s was built in 1744 outside the city walls at Thomondgate in 1744 to replace an earlier mass house. One tradition says Saint Lelia was the sister of Saint Munchin. This was the first Roman Catholic chapel built in Limerick City after the Reformation. It was replaced by a second chapel built in 1799, and the name of the parish was changed to Saint Munchin’s in 1812. The present church was built in 1920-1921 with a cruciform plan with an octagonal partially projecting belfry to the apex of the east elevation, gabled transepts and a five-sided apse. The popularity of the Romanesque style in early 20th-century church architecture is seen in the architectural style of Saint Munchin’s. The Romanesque style door has limestone ashlar piers and a gable parapet. The limestone plinth bases support polished granite colonnettes with limestone cushioned capitals and a chevron archivolt with stepped Romanesque detailing to the soffit. The double-leaf plank timber doors have wrought-iron hinges, and there is a panelled tympanum with Christian and Celtic motifs. There are rose windows in the transept gables set in smooth limestone ashlar surrounds, with limestone ashlar tracery and stained glass. Joseph O’Malley (1867-1933) was the architect and the builders and contractors were J Kenny & Sons. Saint Munchin’s Church was built when Canon O’Driscoll was parish priest and Bishop Hallinan was Bishop of Limerick. The church was consecrated on Easter Sunday 1922. The stained-glass windows in the church were designed by the FX Zettler Studio in Munich. Francis Xavier Zettler was the son-in-law of Joseph Gabriel Mayer and worked with Mayer and Co until setting up his own studios in 1870. His company was appointed as the Royal Bavarian Art Institute for Stained Glass by King Ludwig II in 1882. The High Altar is to the memory of Margaret Carroll. Behind the altar there are three stained glass windows of Saint Munchin, Mary Mother of Sorrows and Saint Michael. 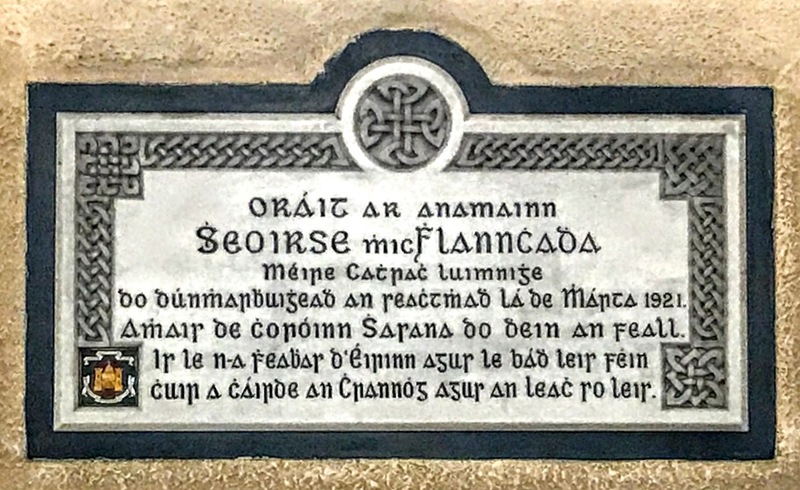 On the right side of the nave, there is a plaque to the memory of Micheál Ó Ceallacháin, who was the Mayor of Limerick in 1920. 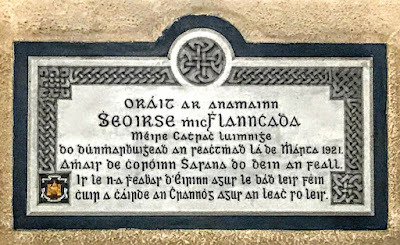 The plaque is in Irish and states that he was the first Mayor who gave loyalty to the Republic because of his faithfulness to the freedom of Ireland. 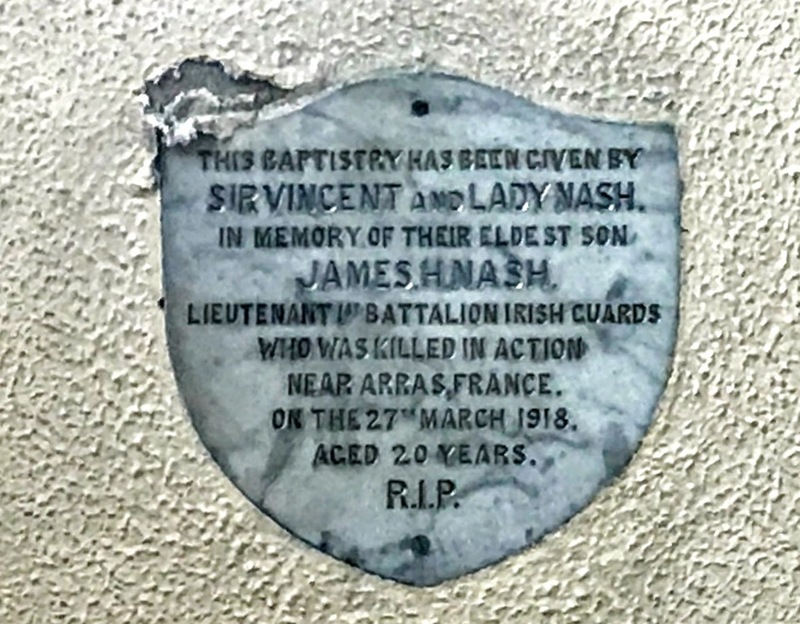 He was killed on 7 March 1921. Personally, I felt uncomfortable with the wording of these plaques. They seem to convey a definition of Irish identity that excluded me, and conveyed a political message that I feel is out of place in a church today. The reference to ‘English Crown forces’ also seemed to be unnecessary, if not offensive, in its phrasing. Were there no Scottish, Welsh or Irish members of the army at the time? It was, after all, not just the English army, and not just the British army. 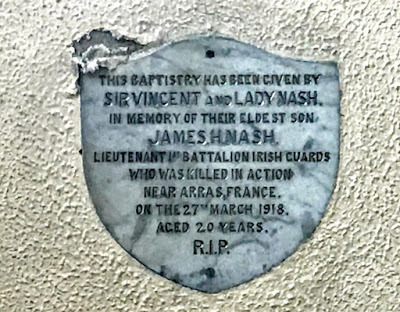 My point is illustrated, perhaps, in the Baptistery, which was donated by Sir Vincent and Lady Nash in memory of their eldest son James, a lieutenant in the 1st Battalion Irish Guards who was killed near Arras in France on 27 March 1918, aged 20. And perhaps my point is further underlined by the fact that this Baptistery is the one part of the church that is sadly neglected and in a state of disrepair today. The Crucifixion scene outside the church was erected to the memory of Canon Andrew Murphy on Good Friday 1929. The High Altar of the earlier Saint Munchin’s church once stood on this site, and the two churches had stood side-by-side until the old church was demolished. 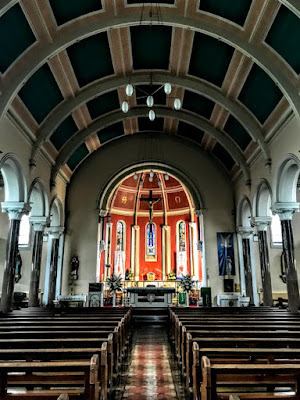 With the growth of Limerick City in recent decades, new parishes have been shaped out of the original boundaries of Saint Munchin’s, including Holy Rosary Parish (1964), Christ the King Parish in Caherdavin (1970), and Corpus Christi Parish in Moyross (1976).